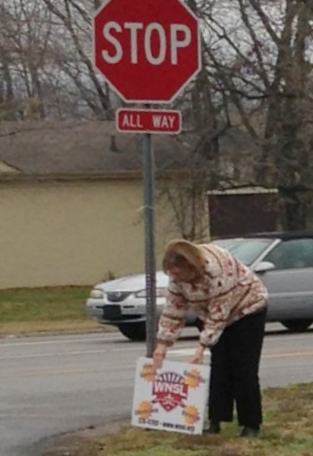 Yes, yes, my friends—this is Thumper who hopped out of the van and ran to the stop sign to check a fallen sign. We were all hoping it said “Yard Sale” but alas, it did not! Vanna captured this poignant photo on her iphone. It is entitled, “Desperation 1” Very aptly, I might add…………….. If They Have One, We Will Come! “An’ he’s all dressed up in a bow tie for Easter, too!” Jabberwocky happily noted. 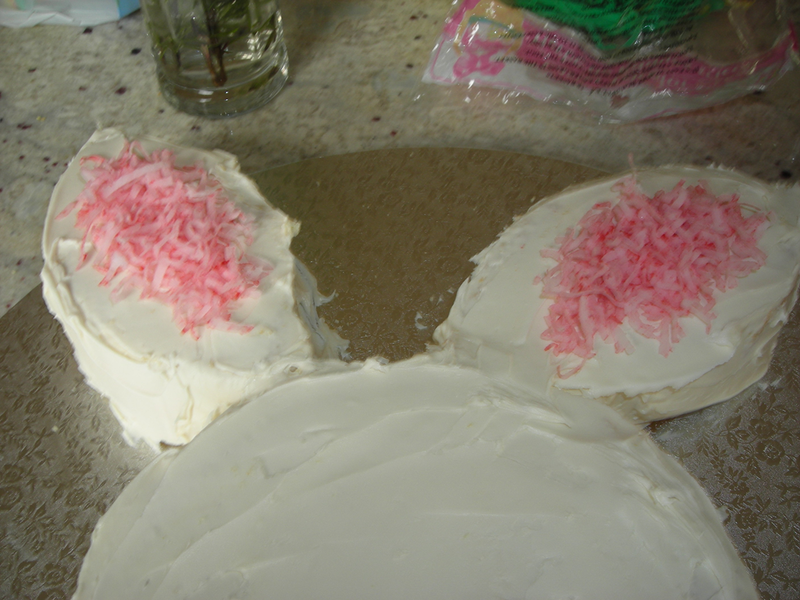 When last I left you, you were standing in front of the freezer, having just placed two separate layer cakes inside and pondering what in the world I had in mind with this alleged bunny cake, weren’t you? Oh. I felt certain you would still be there, just waiting for further instructions, but……obviously if you are reading this, you must have taken a break from your watch and are in front of your computer or perhaps reading from your ‘smart’ phone. Right? Well, for goodness sakes, where ARE you then? Surely not INSIDE the freezer? Goodness! In fact, it was noted by a few (and not just us, either—we do create interest as we many tumble out of the van at sales, or even at fast food restaurants, but that’s another story for another time) that we appear to be rather desperate for sales of which there were only a couple and they were not stellar. Although Cupcake, who has been quite ill for a while, did manage to obtain an almost new, beautiful sweater! (I do think brocanting can make anybody feel better and Cupcake agreed she was, indeed, better.) Girlfriend was in fine form, a very good brocanter if ever I saw one, and we are so glad that Thumper has decided to come out from under the brush and back into the world—she, too has been under the weather. (Thumper actually got out of said van to pick up a downed sign—just to be sure that it wasn’t a yard sale advertisement, and it wasn’t and we were all sorely disappointed, but I digress……) And Vanna?? Why Vanna had LEFT US! 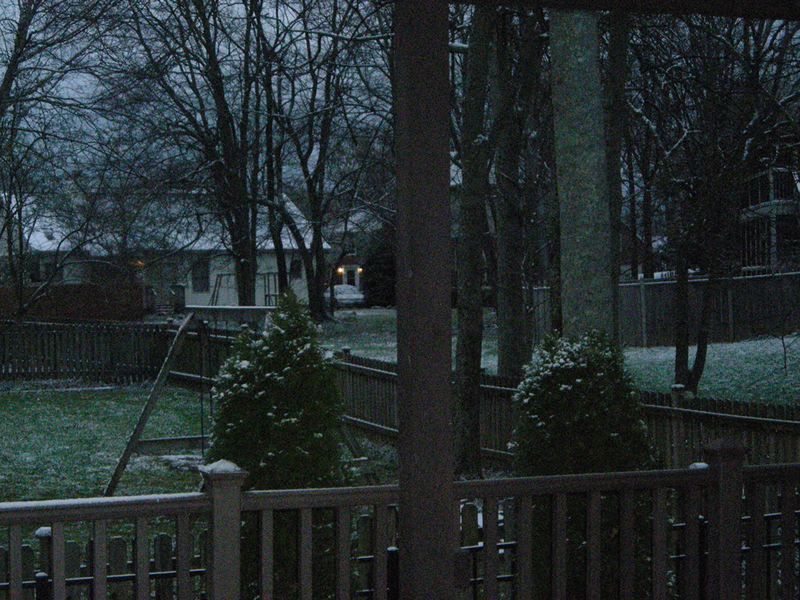 (gasp) for Florida where the sun did not shine, either, almost the entire time she was gone. But she is back, and we are almost complete–Alas, Sosew had other items to attend to, but we are hoping that she will soon be back into the fold, or at least into the van, with the rest of us as we venture out. There is nothing so invigorating than a morning with girlfriends brocanting. Or even just looking FOR brocant sales………. Oh alright, that’s all I have to say about that. For now. 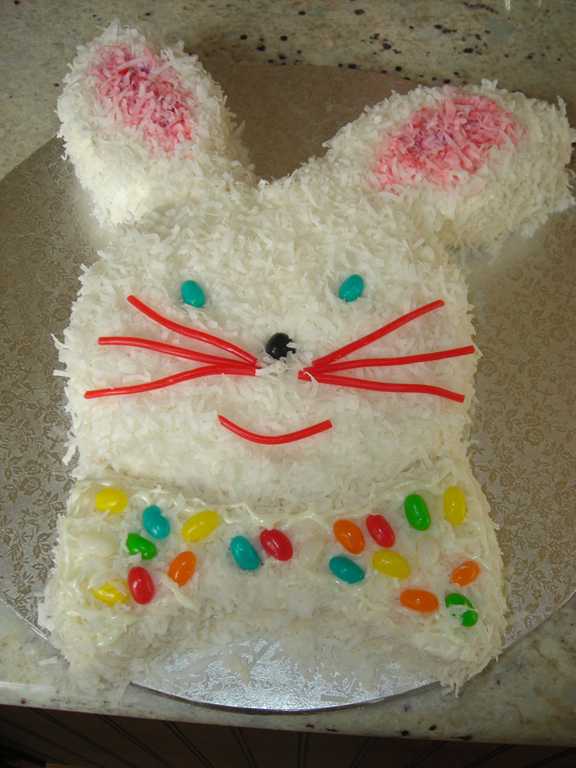 I suppose you want to know how to make the bunny cake, don’t you? Well, whether you do or not, I’m going to tell you……..read on………. First, get out of your freezer and bring your cakes with you. 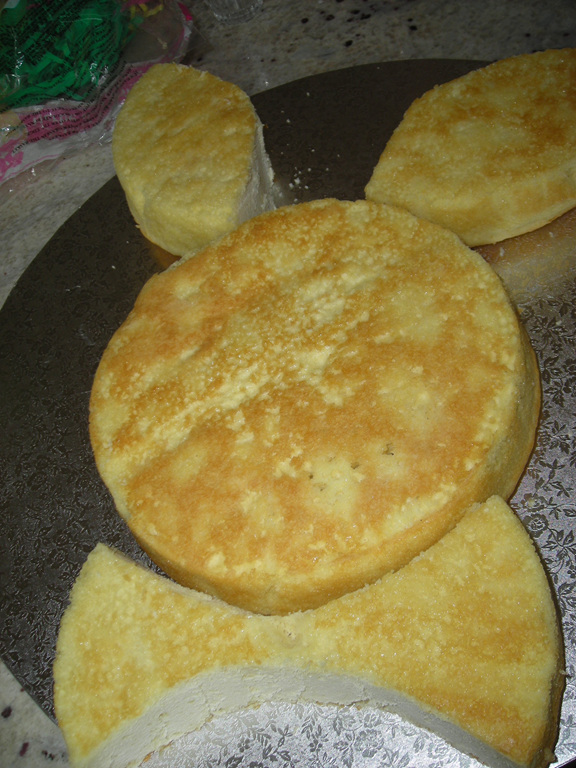 You will need two round layer cakes, preferably frozen separately. A sheet of paper (any kind to make a pattern for your cake) and a round cake pan (the size you used to bake your layer cakes in). 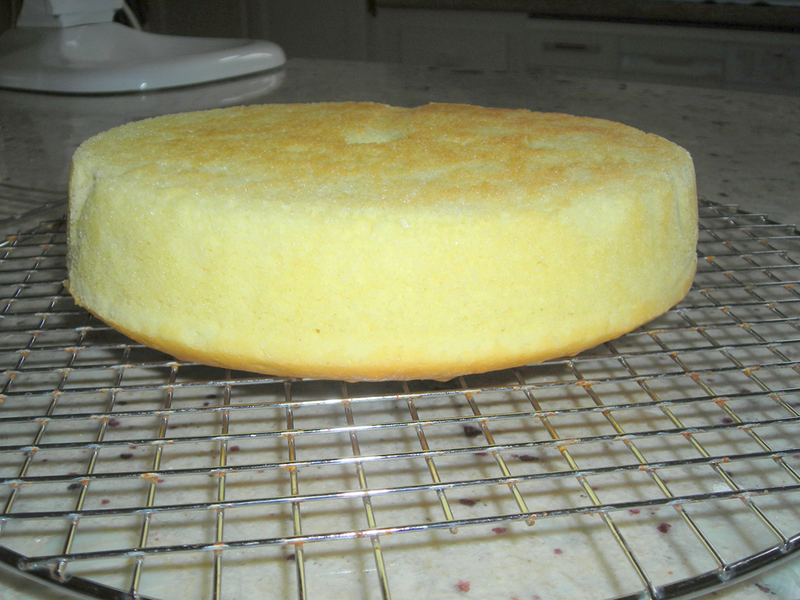 A cake board or a large plate on which to arrange your cake. 1. 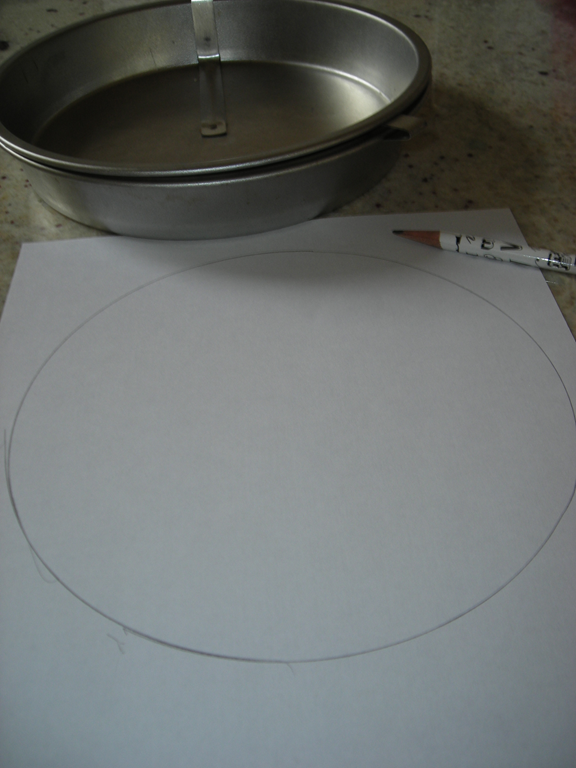 Draw around your cake pan on a piece of paper to make a circle. 3. 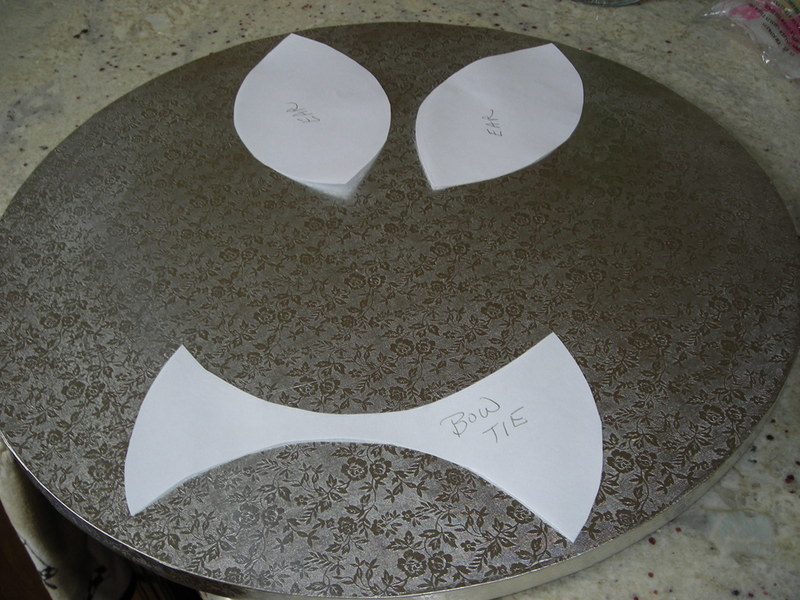 Lay the pattern pieces out on your cake board or plate. “Hey! That doesn’t look like a bunny to me!” commented Jabber. 4. 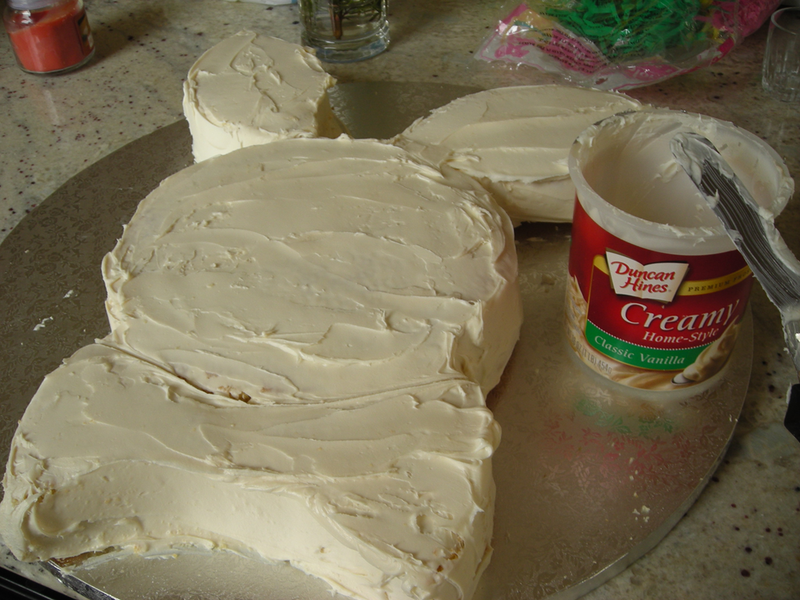 I discovered that this pattern was a bit too large for the cake, so adjust accordingly when laying the pattern on the cake to cut it out. 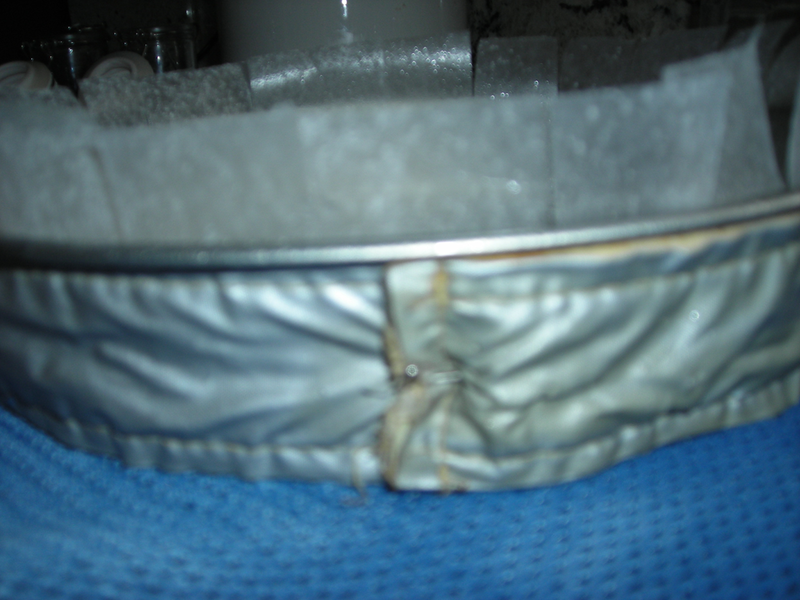 The cake is most easily handled when frozen, but you will need to cut a bit carefully. Lay your cakes on the board and adjust to fit. 5. Frost cakes. I used a can of frosting into which I mixed 1 teaspoon of vanilla. 6. 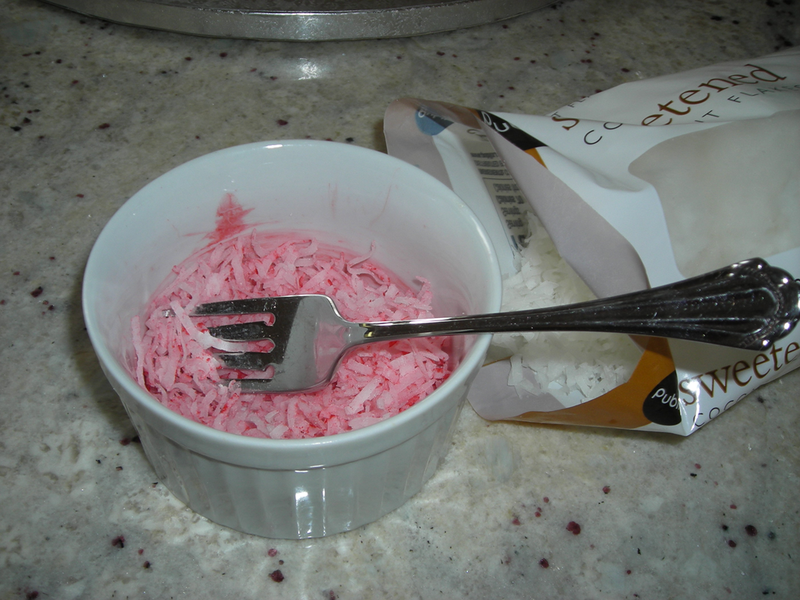 To 1/4 cup of coconut, add a drop or two of red food coloring, mixing well. This is the center of his ears. 7. 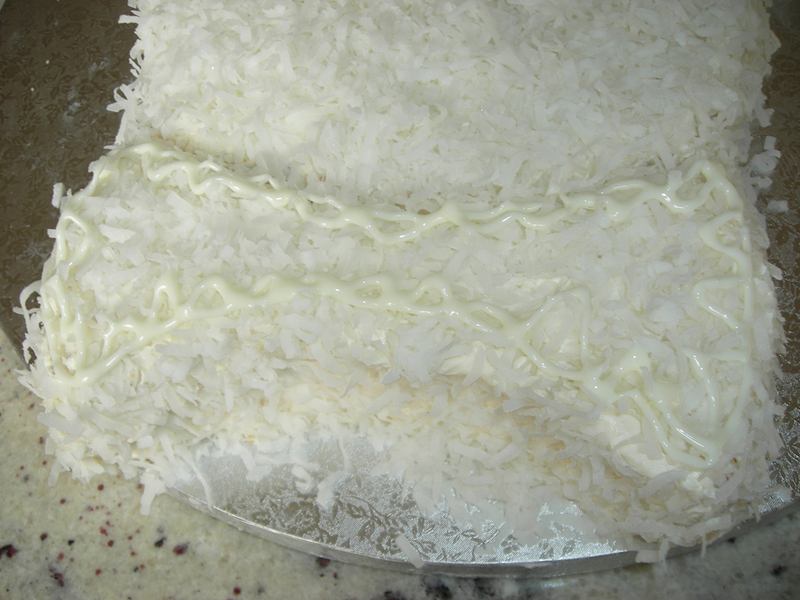 Gently cover the rest of the cake frosting with white coconut. 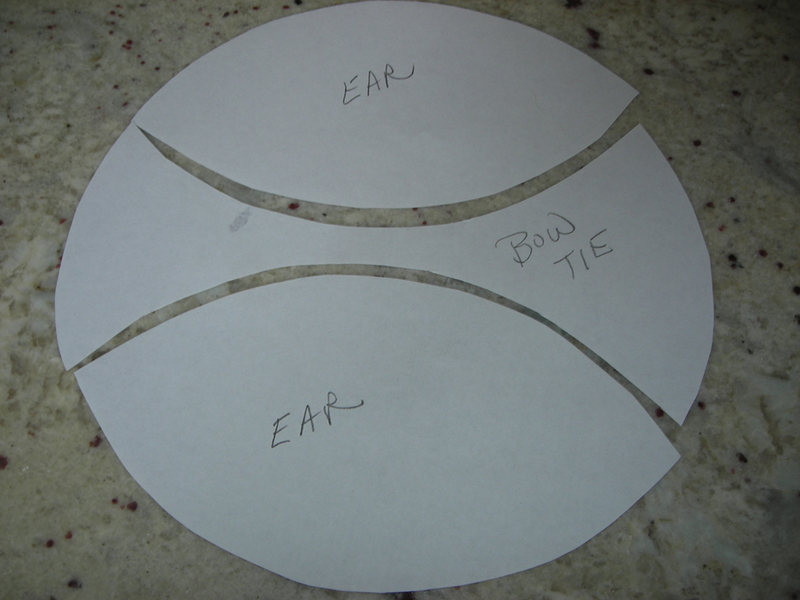 I piped a bit around the bow tie edges—but I noted that it did not show up very well. 9. Randomly press in jelly beans in the bow tie. 10. Use jelly beans for eyes and nose, then cut licorice for whiskers and mouth. *Note: I found this pattern online, and you can as well, but I am unable to place a link to the source. This is not my original idea, but it is a very easy one to replicate. Have fun! 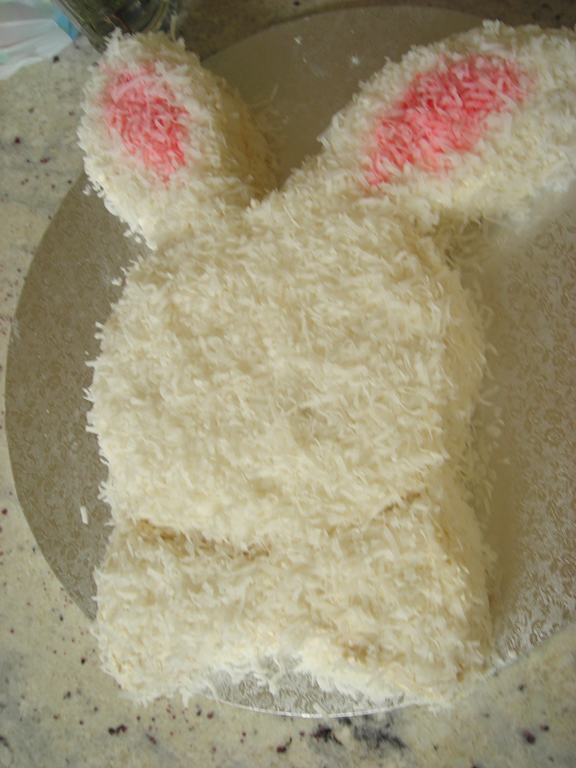 This year I wanted to make a bunny cake, so I searched on the internet for ideas for a simple design. I ran across one and decided to make it. 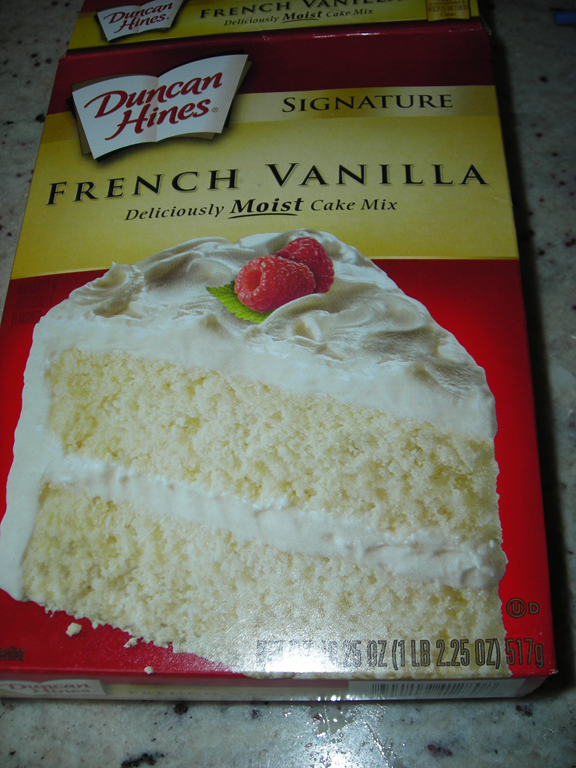 What I have discovered, however, is that the details of baking a layer cake are not included! Again, everyone assumes that we know HOW to bake a cake and all the tricks of the trade so to speak. After 50 years of baking cakes, I do think I FINALLY have some techniques mastered. 1. I used two round pans which I sprayed with cooking spray. 2. 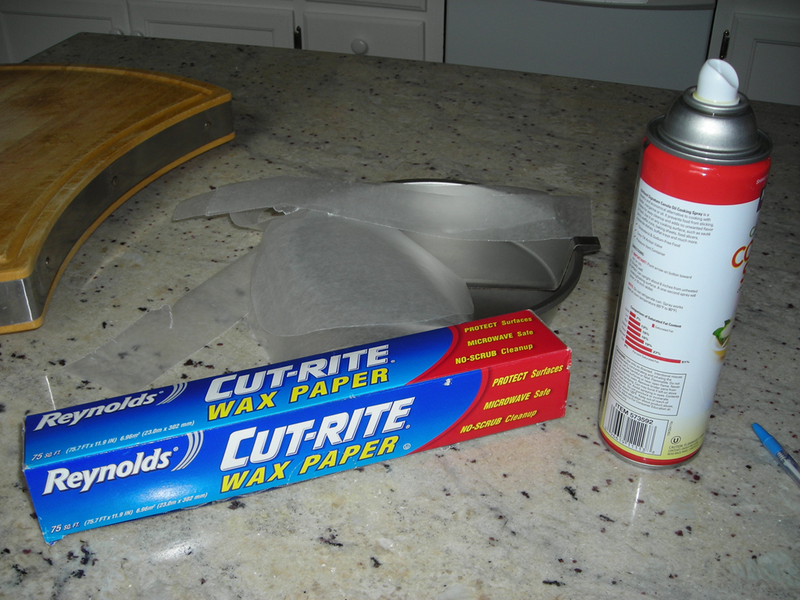 Cut out wax paper circles to place in the bottom of the pans and strips of wax paper to go around the sides. The cooking spray will hold these in place. 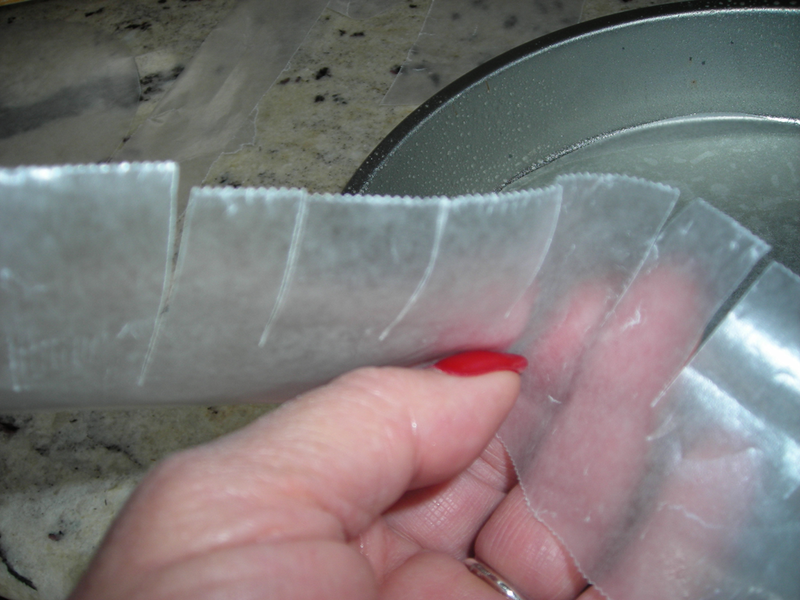 I cut slits all along the top of the strips of wax paper so these strips will lay flat against the sides of the pan. 3. Lay the wax paper in the pan carefully. 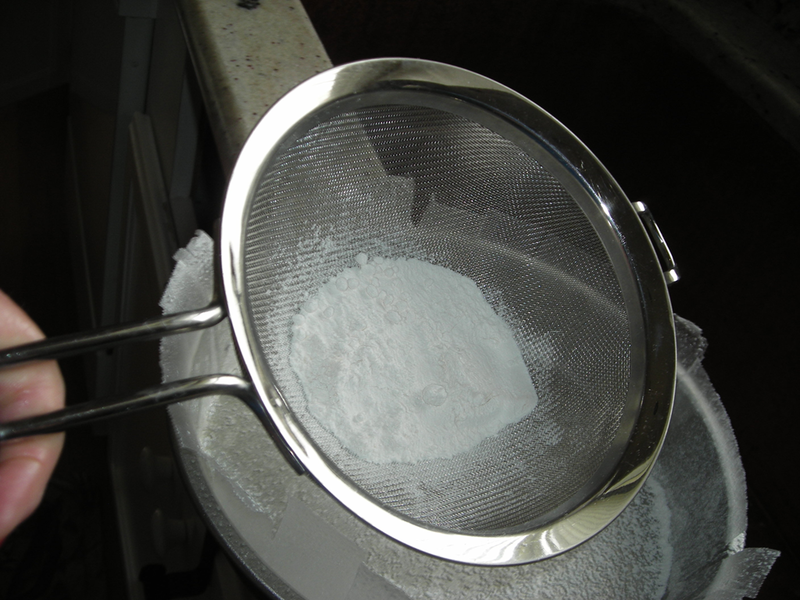 4, Lightly spray the wax paper-coated pans and then sprinkle with flour. Turn upside down over sink and gently tap out excess flour. 6. While the strips are soaking up the water, prepare your cake batter. This time I used cake mix—just add oil, water and eggs. 7. 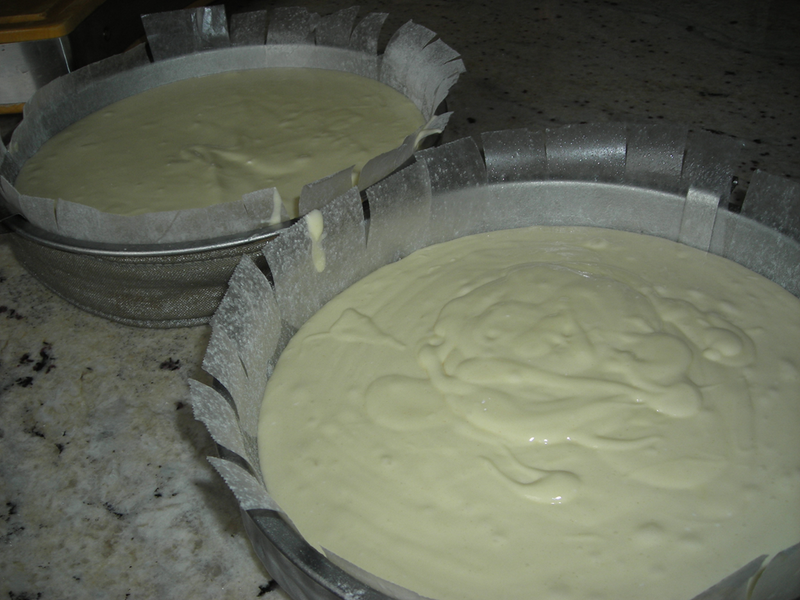 When the cake batter is ready to be poured, quickly take the insulated strips and wrap around the outer edge of the empty cake pans. Secure. Handle very carefully or the strips will fall off! 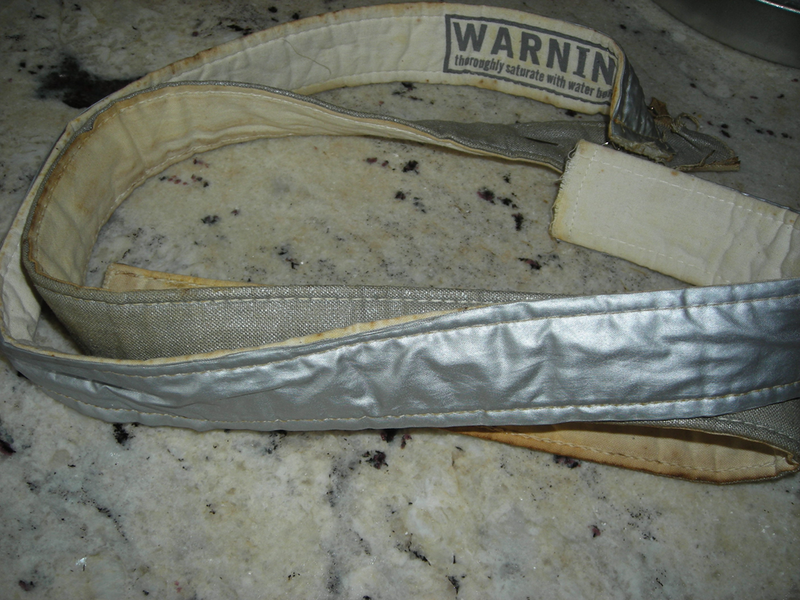 The strips come with long straight pins which one inserts through both layers of the strips to secure. 8. Pour batter into the pans. Try to pour equal amounts into each pan so that your layers will be even. 9. Carefully transfer to preheated oven. (I place one hand on the bottom of the cake pan, fingers spread wide apart to hold the strip in place as I transfer to the oven rack.) Bake as directed. Insert a toothpick in the center of each pan to ensure your cake is done. 10. 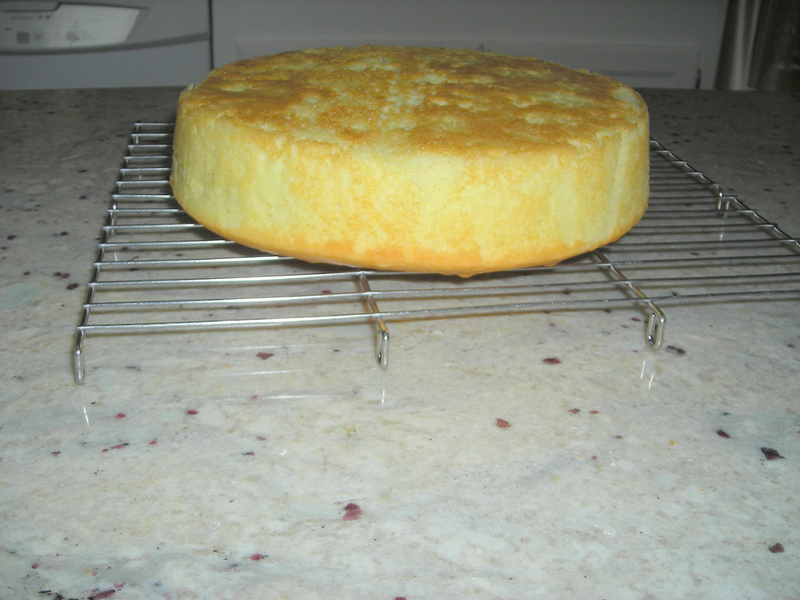 Cool 10 minutes, then invert and slip pan off of cake layer. 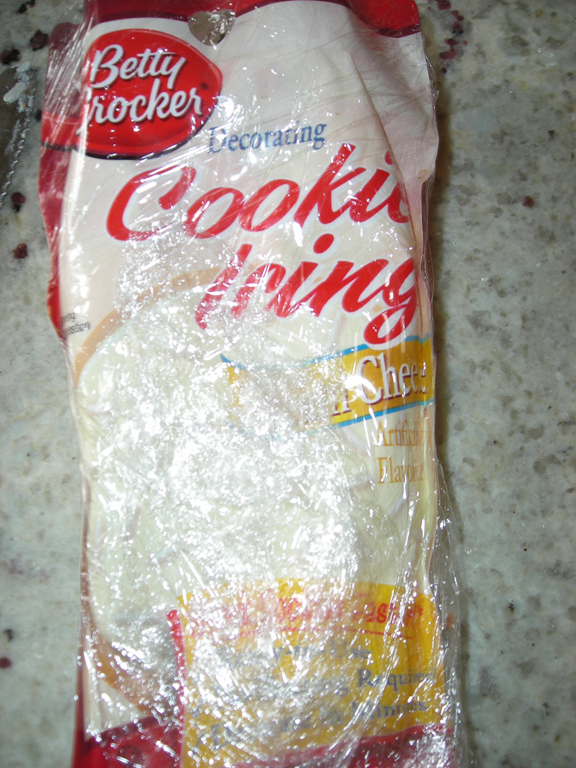 Remove the wax paper carefully from the cake. You should now have two fairly level cake layers. 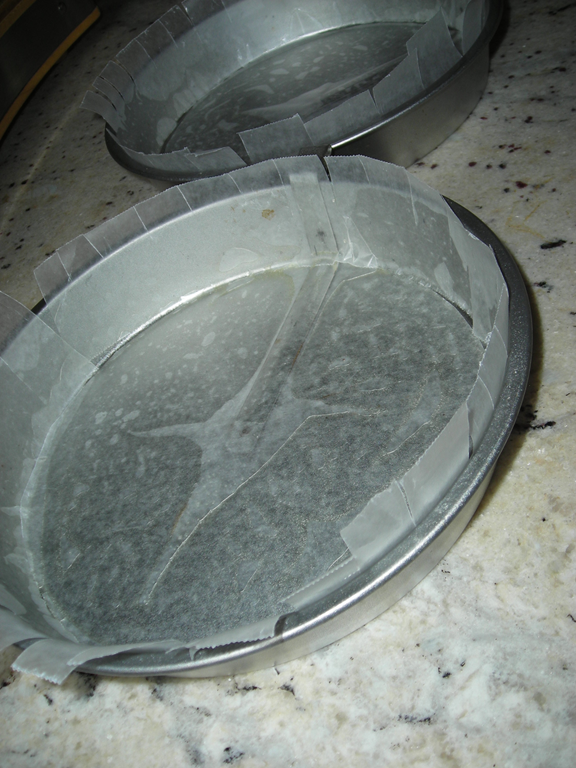 Let them cool completely, then I wrap in foil and freeze prior to decorating. Freezing allows me to handle the cake layers easily. They will thaw rather quickly, too. Now, the fun part: decorate your cake! 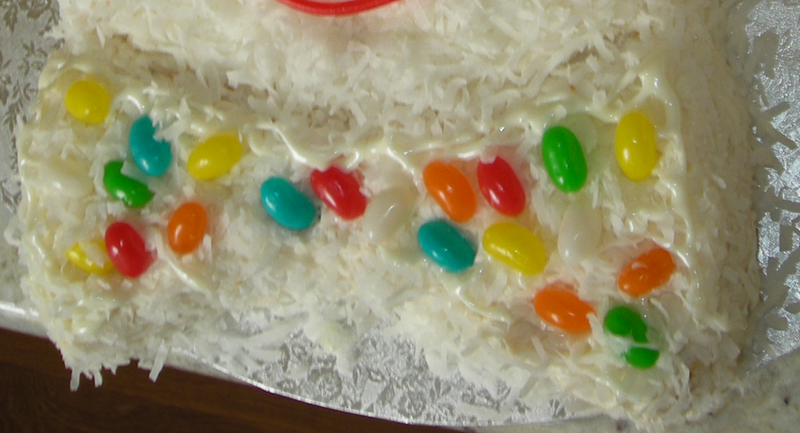 Mine is still in the freezer, so after I decorate it, I will post a picture on this blog. Everyone seems to have a favorite method of boiling eggs. Recently I read one could actually bake them, shell on, in the oven! I have not tried that method. Place clean eggs in a pan of water which covers the eggs. Don’t overcrowd the eggs. Add some salt (this seems to help prevent cracking while they are cooking, although alternatively I believe I’ve used a little white vinegar and that seems to work well too). Place on a burner on medium to medium high heat and bring to a boil. 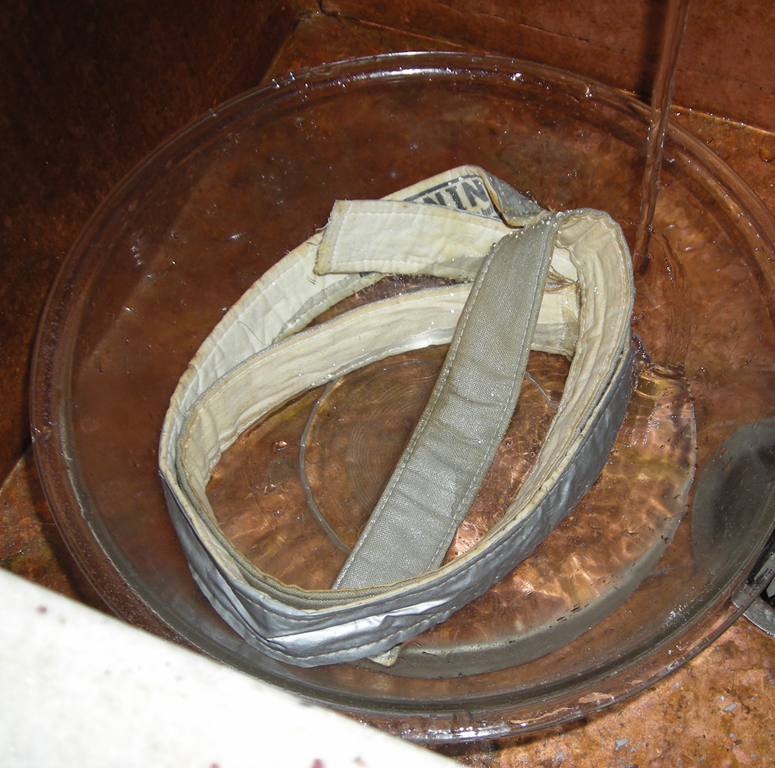 As soon as the water is boiling, I cover and remove from heat. Let them stand for 15 to 20 minutes. They don’t bounce around in the boiling water this way, but they will still cook. Be patient! Set the timer. Gently remove each egg with a slotted spoon, one at a time, and place in iced water. I do this with a bowl in the sink. Keep adding cold iced water until they are covered. If one is going to peel and eat immediately, wait about 2 minutes and then crack and peel the eggs. These should peel very easily and the shell will come off in larger pieces. If they do not, place back into the iced water for another minute or so. Really, there is no hurry on this. 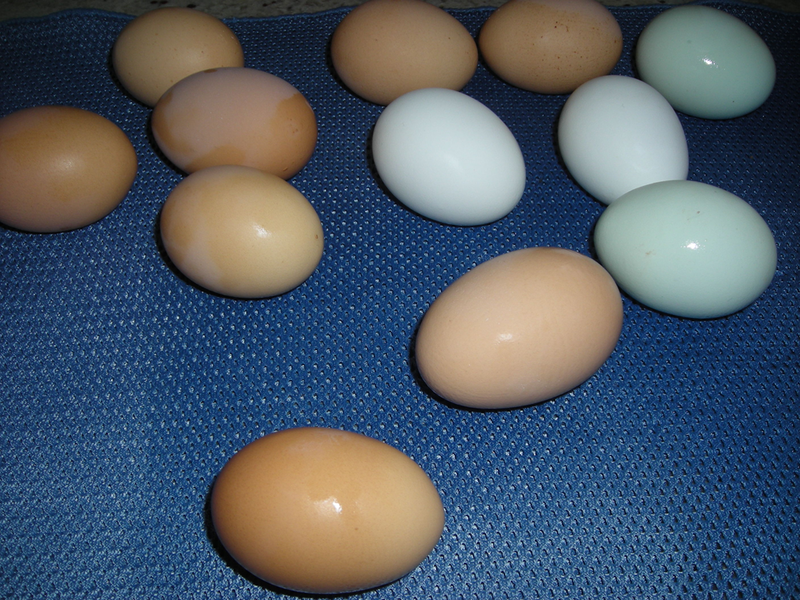 For Easter eggs (or if you wish to keep the shell on), remove the eggs after a few minutes (or more), and gently dry. Place back in an egg carton and into the refrigerator. I seldom have a cracked egg, they seem to peel and be perfectly done in this manner. When they are completely cold, I am able to slice them and make deviled eggs or use as I wish. The yolks are always nicely done, but not overdone. 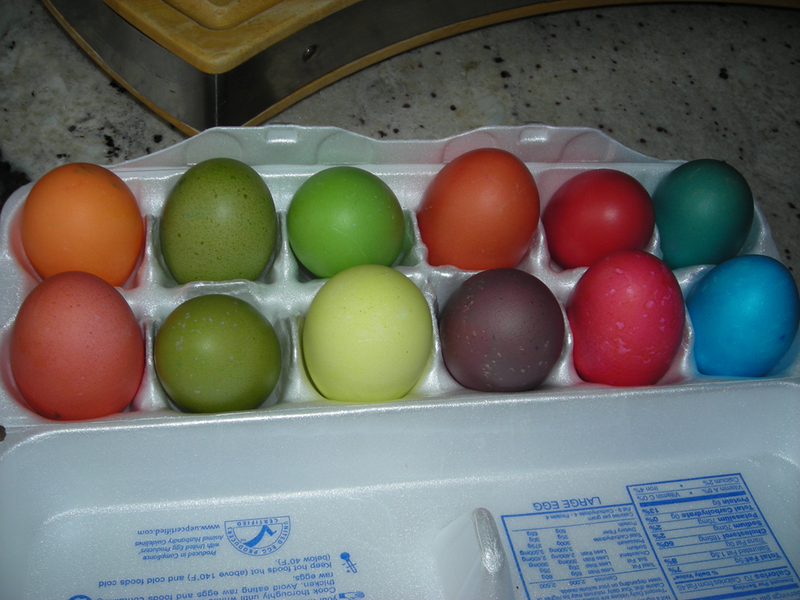 But today I colored the eggs for Easter. It is best to do this while the eggs are a little cool, but not icy cold. I actually prefer to use food coloring, which I have on hand—(the more color one uses in a cup of hot water with 1 teaspoon of white vinegar, the deeper the color). 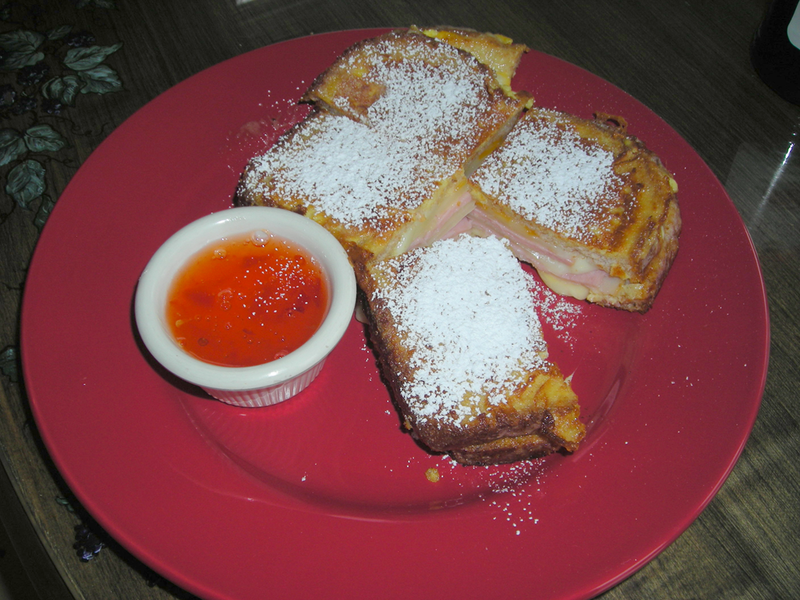 “Who is this Monte Cristo and why are you making breakfast for him?” inquired Jabberwocky. It’s the name of a breakfast/brunch/lunch sandwich. Since it is snowing outside, I decided that I’d make them—seems like a hearty winter-weather type of breakfast. Besides, I had some leftover sandwich meats, some leftover slices of cheese, and I had never made them before, but I do like them very much. I’ve had them at restaurants. This ‘recipe’ is called ‘make it up as you go along’………. 2. Beat some eggs and a little cream/milk/half & half or whatever you prefer in a bowl. To this you could add a teaspoon of a flavoring—vanilla, orange, maple, whatever suits your fancy. 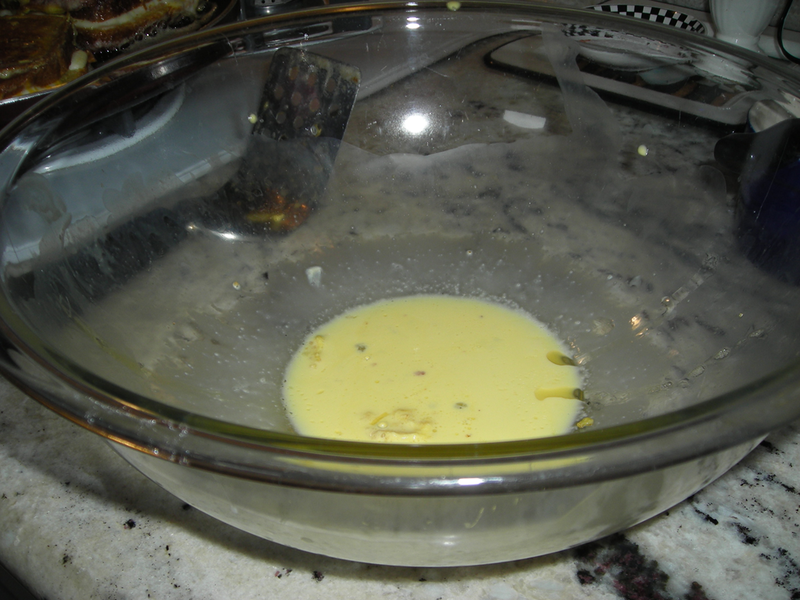 This is the remainder of the egg mixture I dipped the sandwiches in………….you can cook this up, too—sort of like scrambled eggs. 3. Carefully lay the assembled sandwiches, one by one, in the mixture, leave for about 30 seconds and then carefully turn the entire sandwich over to soak the other side. 4. Heat some very mild olive oil and a little butter in a flat skillet on LOW HEAT and then lay the sandwiches in the pan. 5. Keep the heat on LOW and when you see the cheese melting on the bottom layer, you may flip the sandwich over—see if it looks like it is toasty on the bottom. 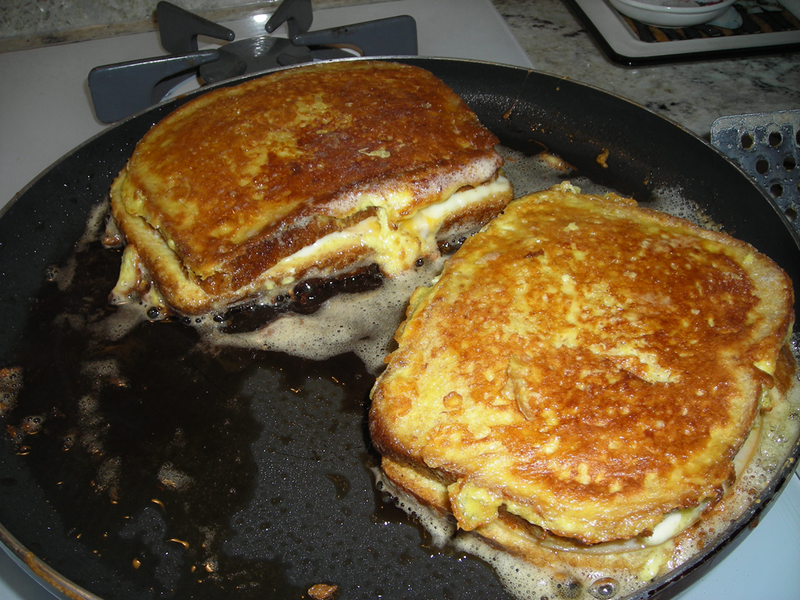 here are the sandwiches just turned over……..
6. When done, remove to a plate, cut into squares or wedges, sprinkle with powdered sugar and serve with melted jelly or jam of your choice—this morning we had hot pepper jelly. Yes, did. 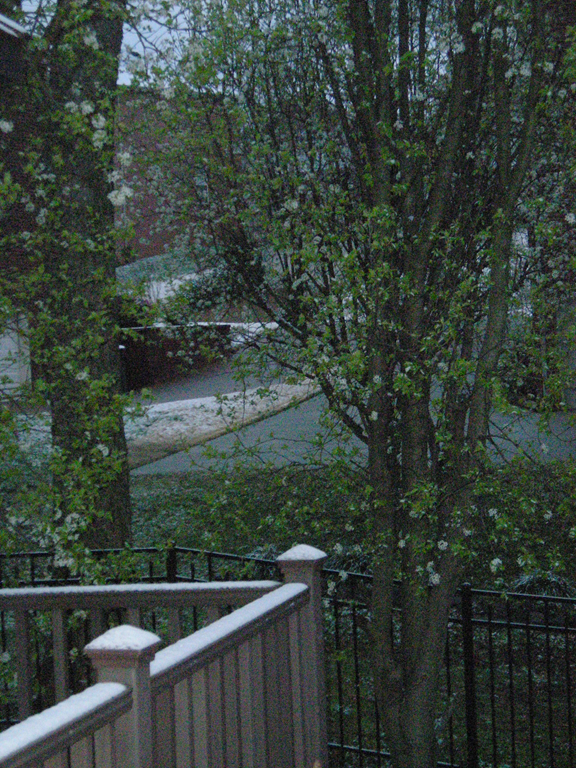 I lied about spring being in the air……. Here around the Harpeth it is not spring—it’s winter. 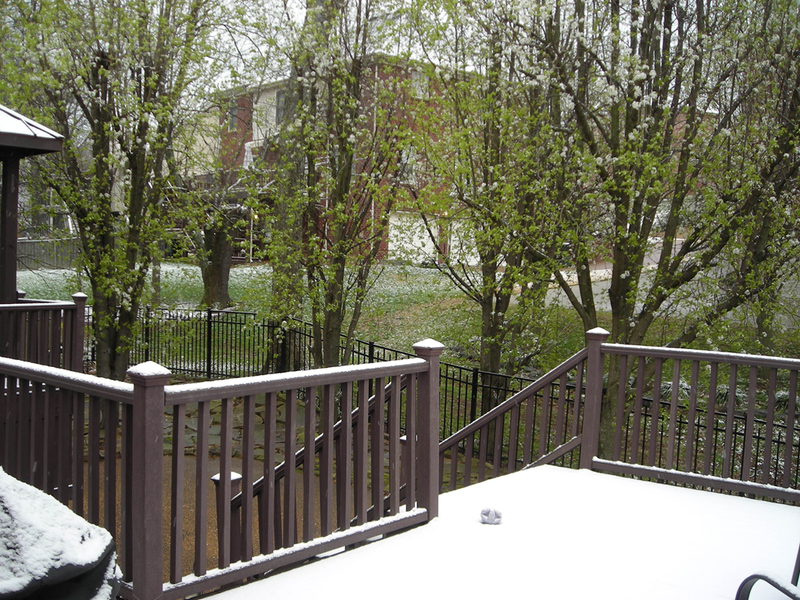 Up in mid-state Illinois where Daughter and family went to visit Son and family for spring break, it isn’t spring either. 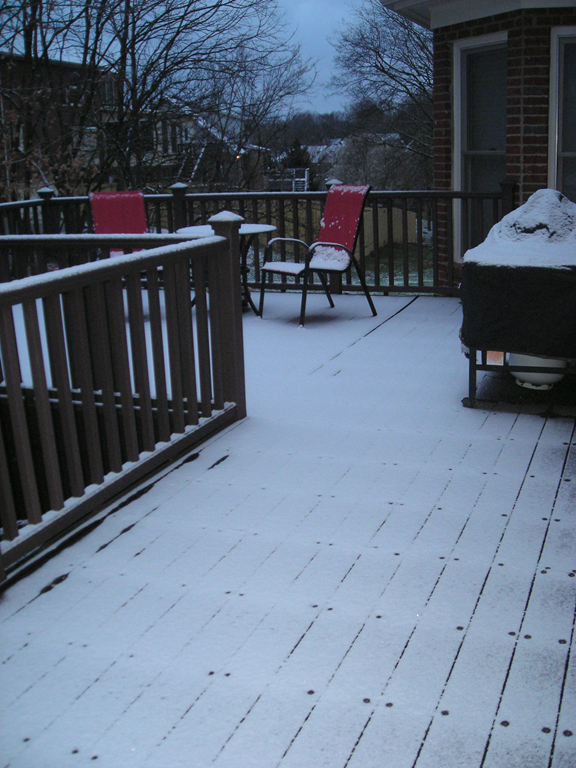 Go here to see some photos of their record snowfall! 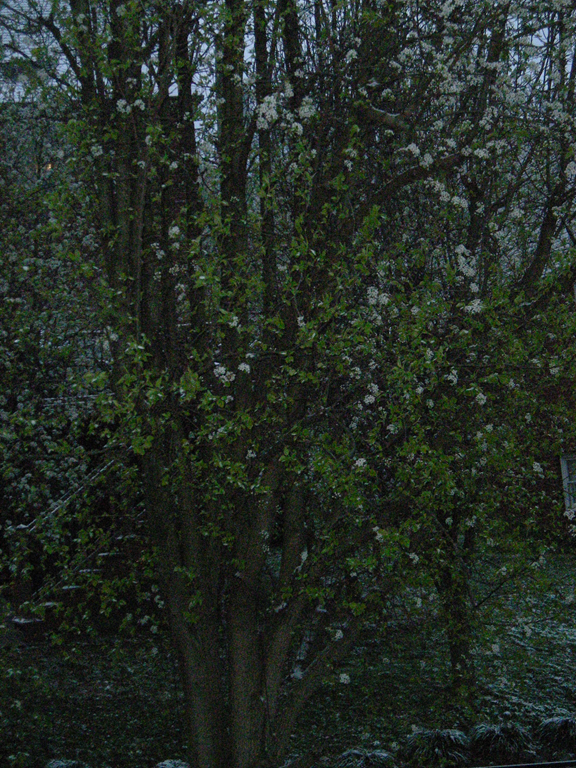 And the Bradford Pear Trees with leaves are in bloom……..
Time for Spring to do some Spring Cleaning, I’d say!! 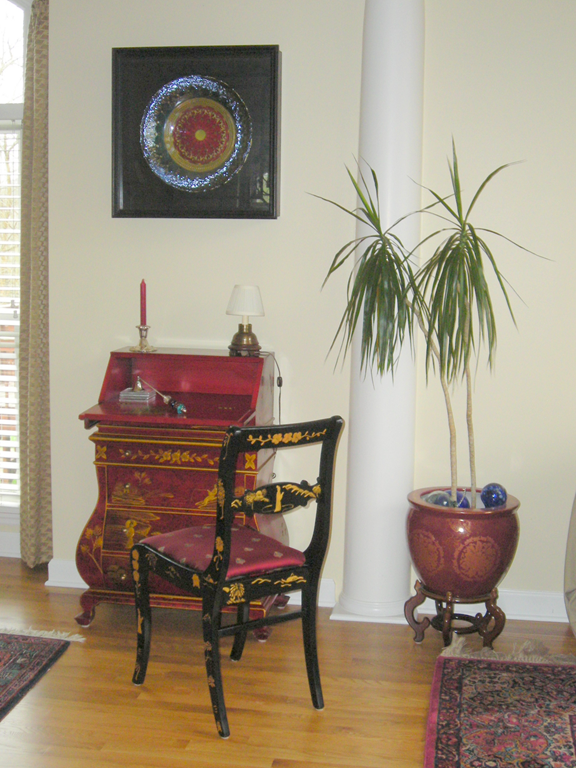 by harpethview in Decorating Tags: Furniture rearrangement. These are things which I have had around the house for quite a while. 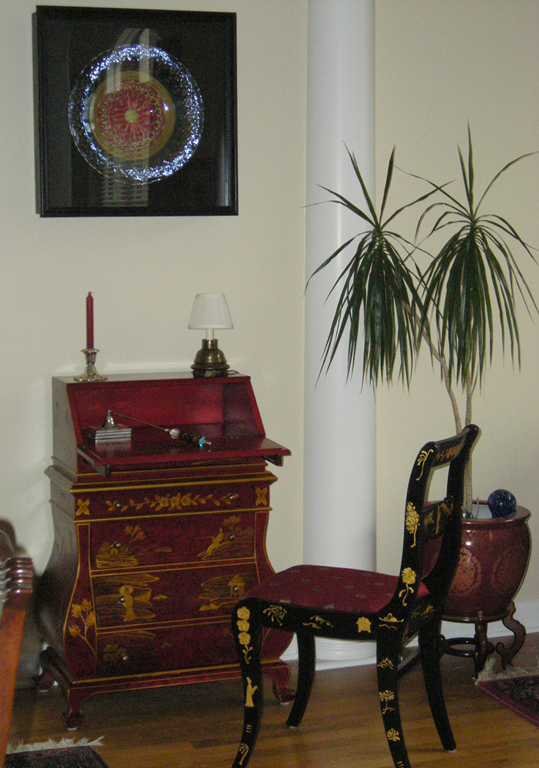 I just moved the desk, chair and plant with stand to enhance the framed bowl. See previous post for better photos of the bowl in its frame.